Projects 3 1/2 to 4 1/2 inches, cafe rod clearance 2 1/2 to 3 1/2 inches. Rods are metal, finials are plastic. Installing curtain rods is easy! Brass finish, drapery hardware collection by Graber, a name you can trust. Size 120 curtain rod solution. Kirsch drapery traverse rods. All rod can be ceiling mount drapery rods or wall mount. Two Way Draw Kirsch drapery rods, Superfine Traverse Rod includes 30 slides and 2 supports. Curtain hardware rods by Kirsch. Long lasting, worry free installations. See how to install drapery rods in the support section. Superfine Traverse Rods include drop in brackets, supports and cord tension pulley for installation. Made from heavy guage steel with a baked enamel finish. Exclusive Kirlon on all sliding surfaces. Push in brackets and extension plates are available as an option. Only the finest pulley sets are used. Strong and durable with a slide gate for easy removal of extra slides. Long wearing, stretch resistant polyester cord and continuous lacing for use at either end or to convert to a one way draw. Two way draw, extends from 66 to 120 inches. Antique drapery rods for tab top curtains, tie top curtains, eyelet curtains or pinch pleat draperies. The wrought iron collection by Kirsch is designed for single and double curtain treatments. Good for kids curtain rods. It also works nicely for corner curtain treatments using the swivel socket to connect the curtain rods in the corners. Even bay window can use this elegant solution. Single and double brackets, holdbacks, rings, finials and a stoutly made 1" rod dazzle in five finishes: Black curtain rods, Rust, Iron Oxide, Iron Gold, and Antique Pewter. Wood brackets for Select Wood 2 1/4" diameter wooden curtain rods. 5 1/2" H , 4 1/4" return. Note: base price for unfinished, colors are more and will display price in cart. Select Rustic Elegance wood curtain rod pole 2 1/4" diameter, 6 feet long. Available in 4,6,8 and 12 foot lengths. Five rustic finishes for selection. Note: 12' rods have to be shipped by truck. 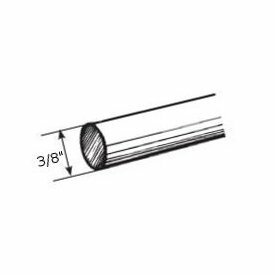 Select wood curtain rod pole 2 1/4" diameter, 6 feet long. Available in 4,6,8 and 12 foot lengths. Ten colors to select from plus unfinished. Base Price is for unfinished rods. Colors will show price in the cart. Note: 12' rods have to be shipped by truck. 5" high x 3 1/2" wide, for 1 3/8" wood curtain rod. Special order, allow two weeks for delivery. Our commitment to quality is steeped in tradition. Whether it's inspiration you seek or innovation you crave, energize your creative spirit with the drapery hardware collection by Graber. Minimum 4 pair per color. 4 1/2"Scarf ring that coordinates with designer metal curtain rod poles and traverse rods. Wood pole bracket for 1 3/8" pole. Matches Wood Trends Classics collection in colors. Front to back: 5 1/4"
5693g: 1 3/8 inch round wood bracket 4 1/2"
Kirsch wood poles can be used for many types of curtain and drapery fabrics. Even wooden decorative curtains, woven woods, can be used with this sturdy drapery pole. Note: Some colors have surcharge added. Brass finish. Cafe rod clearance 2-3 inches, returns 2 1/2-3 1/2 inches. A cafe curtain rod by Kirsch. For Graber 9-200-1 Heavy Duty track. For track size 1" x 1/2" end view.